There's a bun in the oven! And not just mine! This weekend, I styled a Bun in the Oven baby shower for my friend Erin. Erin has TWO fabulous Etsy shops that you MUST visit! She makes gorgeous frames and also handmade fabric bunting, shirts, and capes for children. You might remember the cape that she made for Greyson's birthday party here. The lovely Kristi at Kristi's Printable Panache custom-designed these invitations for us. I told her I wanted a retro feel with red and aqua and she took my idea and RAN with it! I decided on doing a sweets table and also a savory table to break up the traffic in Erin's home. Her lovely fireplace made the perfect backdrop for the sweets table! She custom made the bunting for this party! She was in her sewing room finishing it up while I was doing the table. Isn't it SO cute? It would be precious in a nursery! The painted letters are from Michael's. I bought them in raw wood and had my husband spray-paint them for us. All fabrics (outside of the bunting) are from Joann. I used vintage blue Mason jars to hold all the utensils at the party. I found these at the local antique mall and couldn't believe my luck! The baby blocks were some cheapies in the tacky party section at Hobby Lobby that we spray-painted to match our theme. I hand-made the felt cinnamon rolls. Here is a closer look at that adorable bunting! I had the hardest time finding aqua colored candy, but finally lucked out at Super Target on some berry flavored jelly beans and sour patch kids! 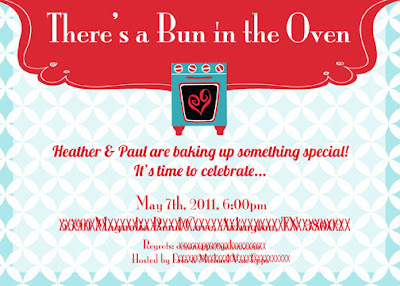 All the printables are also from Kristi's Printable Panache, which she custom-designed for me. Aren't they precious? For the favors, which are later in this post, I ordered custom-made cinnamon roll cookies from Kay's Simply Homemade. They were so soft and tasted awesome! I had some left over, so I decided to put them out on the sweets table as well! One of my favorite things to serve on a sweets table is Little Debbie snacks. They are so affordable and people love them. Plus, you can find a Little Debbie snack to go with just about any theme. (Zebra cakes, Star Crunches, etc). One of the first things that came to mind for me was these Pecan Rolls. I served them on skewers and put them in these cute little Target dollar bin containers. I knew that I wanted to do a cinnamon roll cake pop as well, and I couldn't believe my good luck when I found Mom's Killer Cakes on Etsy. She is local, here in Memphis, but ships around the country. So, she and I worked together on creating a spice cake flavored cake pop that looked like a cinnamon roll on a stick! They were DELICIOUS! I can't thank you enough Sarah! I served them in this precious three tier container that I got at Hobby Lobby. When I saw that container at my friend Meredith's Woodland Bunny 1st birthday party, I immediately asked her where she got it. Hobby Lobby of course! One of the other menu ideas I had for this party was miniature strawberry shortcakes. I topped them with a paper straw and a cute flag that Kristi included in her package for me. One of my husband's major projects for this party was making this oven with me. He was so sweet to help me spray paint all kinds of things, but this was a true collaboration. Martha Stewart has a tutorial on this oven craft here. We modified it a little, to fit our theme, and it turned out SO ridiculous! I left it there at Erin's for her boys to play with. It really is such a fun little novelty item! The cupcake toppers were made by the brilliant Charynn at Two Sugar Babies! I mean, can you get OVER these??!?! I died. Charynn was totally awesome to work with and I knew that the toppers would be cute, but these are just insane. They are EXACTLY what I had in my head. The gingham cupcake liners were from HeyYoYo on Etsy. I got those little cooling racks for the "oven" at the Dollar Tree. A closer look at Erin's gorgeous bunting! For the favors, I used jelly jars and filled them with the cinnamon roll cookies from Kay's Simply Homemade. I topped them with a little swatch of gingham fabric and a cute ribbon with cherries that I found at Michael's. The little red toy oven was an Etsy vintage find. It was white, but that's nothing a little spray paint can't fix! On top of each jar, was a small sticker designed by Kristi. It says...."Take your own bun home!" For a cute little activity, I had Kristi design a "recipe card" for baking a new bun! At the bottom, it said..."From the Kitchen Of...."
I made this cute little recipe box out of a raw wooden box and a cute little rolling pin that I found at Hobby Lobby. In the dining room, I set up the savory buffet. I didn't want to do a centerpiece, and instead focused on a large hanging arrangement from the chandelier. There, I hung tissue poms, some of my felt cinnamon rolls, lace doilies, lanterns, and more small rolling pins. That vintage Coke crate just keeps coming in super handy! The savory buffet had pork tenderloin sandwiches with jezebel sauce, strawberry and blueberry skewers, pinwheels, finger sandwiches, BLT dip in a bread bowl, and Asiago Tapenade rolls. I wanted to hint at the cinnamon bun theme by having some things that were rolled. In the window, I hung more paper decorations to bring a little color to that side of the room. Hope you enjoyed my Bun in the Oven baby shower! Congratulations to Heather and Paul! Special thanks to Erin and Michael who were so great to work with! I look forward to working with them again soon! (After my own bun makes his appearance, that is!) Don't forget to check out Erin's Etsy shops! How cute! Love the colors and the theme is just so fun! I know I've told you a hundred times already, but this party was PERFECT. You made everything gorgeous, perfection down to the tiniest detail. And EASY (despite my poor time management skills). We had so many compliments and I know P and H had a great time. Thanks again for helping me give these special friends such a fantastic party! Love the colors & the pecan/cinnamon rolls on a stick?!?! LOVE! As usual....fabulous party! LOVE that oven on the table!! Awesome, Brit! What an adorable and creative shower....PERFECT for a gender neutral shower! You are amazing! Such a cute theme! Everything looks great..love the oven too!! Sooo cute! love this theme, and love the color scheme you chose! Such an exquisitely detailed party! I love the little oven, and all the bun themed treats! oh I absolutely LOVE this! The colors are gorgeous! I love this! What a clever idea, the theme! Really, it's too cute! Stopping by from kellys! This shower looks incredible, you did a great job and what a CUTE idea!!!! This is so cute! I am thinking of throwing a similar shower for a friend. Where did you get the box for the adorable oven? It looks like it is a box with a lid. Hi Kristin, It's a banker's box. You can usually get them at Target or OfficeMax/Depot. Thanks! I'm excited to make it!